The yellow dot marks Bassett Road (Russell's Folly). This aviation photograph was taken before the motorway was built, and the curving line to the right of the photo is the 1885 railway line. Photo: White's Aviation 1941. Russell’s Folly was the name given to a piece of road just north of Johnsonville engineered by Captain Andrew Hamilton Russell of the 58th Regiment. Today that road is known as Bassett Road. Bassett Road begins at the Johnsonville round-about, passes St John Anglican Church on the west, and heads off east down a hillside north of the Church. 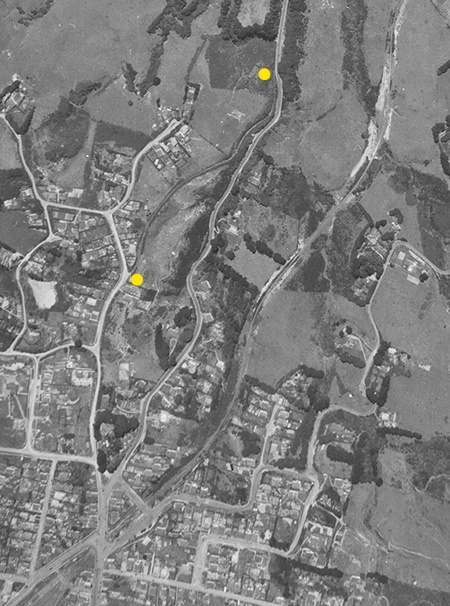 When it was built, this road was part of the main road north from Johnsonville to Porirua. 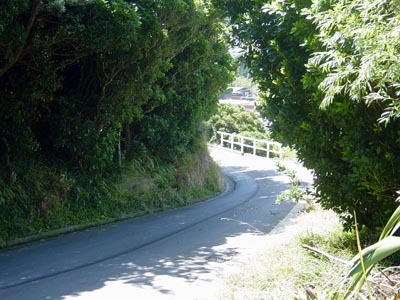 Instead of being the dead-end road that Bassett Road is today, the original road continued down hill to the stream at the bottom. This steep incline was very difficult to negotiate and subsequently gained the name Russell’s Folly. When was Russell’s Folly engineered? I suggest the date Captain Russell engineered his folly was during the spring and summer of 1846-1847. This is because published material suggests the road north of Porirua was little more than a footpath in August 1846. Additionally, the 58th Regiment, led by Captain Russell, was stationed in the area to accompany and protect workers on the road in 1846. The following information from published material is a helpful guide as it places Captain Russell in the locality of The Halfway (now Glenside) with the 58th Regiment at that time. Tawa Flat and the Old Porirua Road 1840-1982 by Arthur H Carman p30. The Old Porirua Road, Porirua Museum History Series, Compiled by Kelvin Day, 1991, p10. Tawa Flat and the Old Porirua Road 1840-1982 by Arthur H Carman p47. The Old Porirua Road, Porirua Museum History Series, Compiled by Kelvin Day, 1991, p8,9. In 1847 the first Anglican Church in Johnsonville was built. These days the Church on the site is called St John Anglican Church. In 1847 it was called Hawtrey Church and the main road was on the west side of the Church. However, in 1854 the main road on the west side of the Church and Russell’s Folly was by-passed. This was done by forming a cutting through the hill on the eastern side of the Church. George Mexted did this work. Onslow Settlers of the 1840’s: George Mexted by Julie Bremner cited in The Onslow Historian,Old Johnsonville Stories No 1 1978, p31. Although Russell’s Folly was no longer part of the main road north, it continued to be known locally as Russell’s Folly. People on foot used Russell’s Folly as a shortcut down to The Halfway. After 1928, when The Halfway was renamed Glenside, the shortcut was still popular for youth. Murray Henderson told me he cycled down it as a school-boy during World War II and injured himself badly when he fell from his bike. Public access via Russell’s Folly down to the main road north was lost when Middleton Road was widened however I am not sure when that road widening took place. I asked Mrs Robin Barwick, who lived in Bassett Road from c1976 -1999 if she knew about Russell's Folly. She was aware that Bassett Road extended on paper down to Middleton Road however said that there was no access track during her time living there. However, she did recall that her teenage son used to scramble down the steep slope of the Bassett Road end to Middleton Road for a short cut! The next section in this article discusses the gun wagon rolling with its load of artillery - Claire Bibby, Glenside.